Nicaragua’s Pacific coast stretches for more than 200 miles from its northernmost tip to the country’s border with Costa Rica in the south. This is one of the world’s most dramatically beautiful and varied coastlines, offering both white and black sandy beaches as well as soaring cliffs and small hidden coves surrounded by lush jungle. There are no cities to speak of on Nicaragua’s Pacific coast, only small fishing villages, a few friendly towns, and lots of open space. In addition, this coast is dotted with master-planned beachfront communities undertaken mostly by American developers and built specifically for the American retiree market. These full-amenity developments can be five star and impressive, but they come with price tags to match. In addition, along this coast you find old Nicaraguan resort destinations. These are very different kinds of places, offering more low-key lifestyle options. If you visit only the master-planned communities, you can come away with a misimpression of what Nicaragua’s coast has to offer. Parts of it could be described as an expensive playground for American expats and retirees, but this coast has another face that is less packaged, more authentic, and much more affordable and that, unfortunately, most visitors miss. One of the best examples of this hidden face of Nicaragua’s beautiful Pacific coast are the towns of Masachapa and nearby Pochomil. 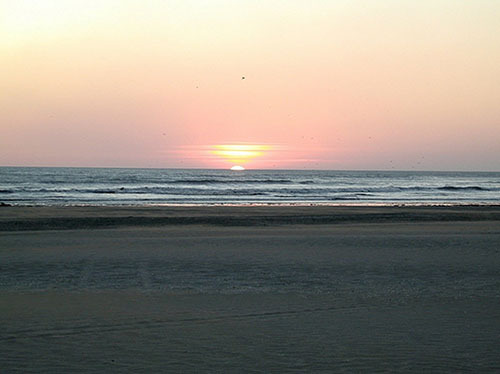 Masachapa is located where Nicaragua’s Highway 8 meets the ocean. If you head out from capital city Managua or Granada, Nicaragua’s best known Spanish-colonial town, in the direction of the beach, Masachapa lies straight ahead. Masachapa is the nearest developed seashore town to Managua, located only an hour and twenty minutes away. Managuans come for the day. The town is also host to a good number of second-home owners, including a diverse mix of international residents. Two things put this area on the map, aside from its status as a seaside destination. One is the nearby Barcelò resort at Montelimar Beach, about a mile north of Masachapa. The other is the presidential seaside retreat on the beach in Pochomil. While Masachapa has a very local feel, Pochomil is more exclusive, with more character and charm and generally nicer homes. Pochomil Viejo (old Pochomil) is the most exclusive area, with only 40 homes and restricted access. It’s like a private gated community with a semi-private beach lined with open-air seafood restaurants. The beach at Masachapa and Pochomil is one of the best swimming beaches in Nicaragua. To keep things in perspective, remember that this is a rural area in one of the hemisphere’s poorest countries. If you’re not accustomed to life in rural Latin America, you should visit to get a firsthand impression. Masachapa and Pochomil are not good retirement choices if fine dining and upscale shopping and entertainment are priorities for you. However, if you’re interested in retirement on the Pacific coast, this is an appealing option you’ve probably not come across. 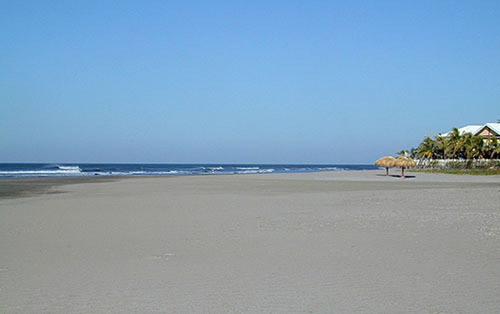 Masachapa and Pochomil offer mile after mile of wide sandy beaches bordered by warm blue waters. The people are friendly, it’s summertime year-round, and Nicaragua offers the world’s most affordable retiree residency program. You can qualify with as little as US$600 of pension income per month. In addition, the cost of living in this part of Nicaragua is extremely low, as is the cost of buying an oceanfront home. You can dine on fresh-caught shrimp and other seafood at a beachside restaurant for just a few dollars while watching the sunset over the water. The simple seaside charm of this coast would be hard to beat anywhere. As would the cost of living and, especially, of purchasing a beach house. In one of the planned communities on this country’s coast targeting American retirees, you could easily spend a half-million dollars or more for a beachfront home. In Masachapa or Pochomil, you could own your own home on the blue Pacific for as little as US$110,000. That’s the cost of a recently renovated beach house with three bedrooms, three bathrooms, maid’s quarters, a roofed terrace, and a two-car garage currently on the market and being sold fully furnished. You could spend more, of course. However, the top end of this market pushes US$250,000, not US$1 million as in better known and better packaged locations along Nicaragua’s coast. Masachapa and Pochomil would not be for everyone. However, for the retiree on a budget who has dreamt of the California dreamin’ lifestyle in retirement, this undiscovered stretch of Nicaragua’s coast could fit the bill nicely. Black sands and Pacific sunsets are Masachapa’s best features. In Pochomil Viejo, I found a two-story home with a total area of 457 square meters (4,900 square feet). With four bedrooms and three baths, the house also offers a storage room, laundry room, private water tank, terrace, bar, and garage. The asking price is US$160,000. On Masachapa beach, I saw a spacious 270-square-meter (2,900-square-foot) house for sale, with gardens and two oceanfront porches. The house includes four ocean-view bedrooms, three bathrooms, a garage, and a caretaker’s quarters in a separate bungalow. This property is listed at US$250,000. Another beautiful home, right on the beach in Masachapa, offers 300 square meters of construction (3,200 square feet) plus a 700-square-meter terrace (7,500 square feet). It has three bedrooms, two baths, a garage, and a laundry room, all with ceramic tile floors. The asking price is US$210,000. This is a well-appointed home that I would find suitable for full-time living.